A presentation of the PATH Intl. Equine Welfare Committee webinar on equine welfare best practices will be October 14, 2014, at 3:30 p.m. Eastern Daylight Time. The webinar is free and can be counted for 1 hour CEU for PATH Intl. Certifications. Click here to sign up. Congratulations to New Region Reps! The PATH Intl. Membership Oversight Committee is the voice of the PATH Intl. members, advocating for their interests to the association and the industry. The committee, through its members, actively supports the organization in identifying and implementing membership features that will enhance the value of association membership and convey the importance to the equine-assisted activities and therapies industry. Elections for region reps recently were held in the even-numbered regions. We are pleased to announce the newly elected (or re-elected) region reps.We thank them for their willingness, enthusiasm and dedication to PATH Intl. Their term will start January 1, 2015. Congratulations! Are you looking for something out of the ordinary for your time in San Diego? Frolic in the waves while scouting for nearby dolphins. 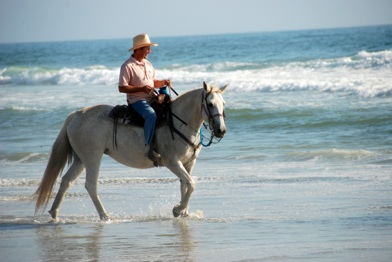 San Diego Beach Rides (formerly Happy Trails) rents horses so you can enjoy the best of surf and turf on horseback. Ride along the U.S./Mexico border to the only place in San Diego County where you can ride a horse on the beach! Check out their website for more information. They are open 7 days a week for a perfect addition to your time at the PATH Intl. Conference. The Mental Health and Learning track continues to offer exceptional education opportunities for licensed counselors and social workers to earn CEUs. There is a fee of $25 per person per organization (NBCC and NASW). Sign up onsite at registration. PATH Intl. will provide a certificate at the end of the session as your proof of attendance to submit to NBCC and/or NASW for CEUs. Here are just two of the many Mental Health and Learning sessions. Learn how to incorporate eye movement desensitization and reprocessing (EMDR) into an EAAT program in Mounted EMDR: New Hope for Trauma Survivors, taught by Martha McNiel. Learn more about important psychotherapy skills and ethical considerations in Psychotherapy 101: Equine-Facilitated Psychotherapy Ethics and Skills for Equine Specialists with Hallie Sheade, Lindsay Box and Hannah Yterdal. Do you have a product equine professionals would be interested in purchasing? Educational materials, books, videos and jewelry are all great possibilities for selling to the EAAT professionals we will see at the 2014 PATH Intl. Conference, October 29-November 1 in San Diego. 96% of 2013 conference survey respondents said they will contact one or more exhibitors. Purchase a booth by October 15 to reserve your space! If you are interested in sharing a room with someone at the conference, PATH Intl. maintains a roommate/share list on the My PATH Intl. Membership Page. Contact Cher Smith to be added to this list. PATH Intl. strives to provide its member centers with both tangible and intangible benefits. Last week, the primary center contacts were sent links for a value survey. This value survey asks member centers about their satisfaction in the organization and addresses the benefits of membership. Just a reminder, if you haven't yet, please complete the survey. Completion of the survey will make you eligible for $50 in PATHBucks. Thank you for your generosity! The PATH Intl. 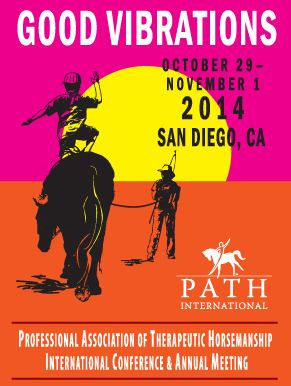 Independent Adult Equestrian of the Year Award will be renamed the PATH Intl. Paul Spiers, PhD, Independent Equestrian of the Year Award thanks to the donations of 23 individuals totaling $5,120 (we exceeded our goal of $5,000). Dr. Paul Spiers served as PATH Intl. Board of Trustees President from 2006 to 2008. 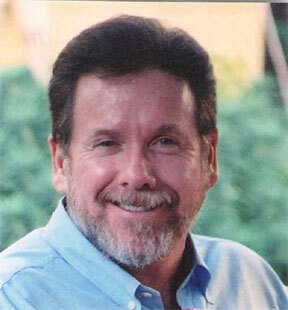 Paul, who passed away September 2013, had a great passion for PATH Intl. and championed its programs and initiatives in helping individuals to overcome challenges and gain independence. We are pleased to grant this award in his name. Paul's sister, Blue Schindler, will be in San Diego at the PATH Intl. Conference to help present the award in his name. Thank you all! Most of us have heard of the notorious bot fly and have learned to recognize the tiny whitish or yellowish eggs that the female fly deposits on a single hair on our equine's forelegs, neck, shoulder, flank, throat and/or muzzle. But how much do we really know about the life cycle of this equine pest, and what we can do to recognize and prevent problems in our equine partners? Read more. For more equine tips, and for an insightful and engaging look at the horse-human partnership, come to the PATH Intl. Conference and horse expo, October 29 - November 1, featuring world-renowned horse clinician and trainer Chris Irwin. Gem is SmartPak's Horse of the Month for September. 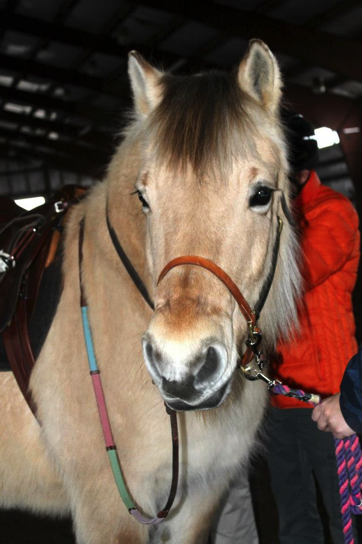 Gem makes her home at Wings and Hooves Therapeutic Riding, Inc., in East Kingston, NH. Congratulations, Gem! Read Gem's story and discover what's in Gem's SmartPak. SmartPak is looking to choose the next Horse of the Month, which will receive $100 of SmartPak products for a month. Nominate your horse in October for a chance to win! Photos are highly encouraged! Please take the time to help PATH Intl. build the new Industry Orientation and survey for potential instructor candidates by completing the Industry Orientation exams and survey for potential instructor candidates. Your feedback is greatly needed. The more certified instructors we have participating at this testing stage will help in ensuring a quality and useful tool for future PATH Intl. Certified Professionals. The validation test will be open through October 10. Help the EQUUS Foundation, a PATH Intl. Sponsor, show the world how horses "roar." Through October 7, eight non-profit animal and wildlife organizations are competing to raise the most donations. Animal Planet is matching these donations dollar for dollar during this time up to the first $100,000 raised. But you don't have to donate to help! You can help by voting who you feel deserves the Fan Favorite Bonus of $10,000 to be donated by Animal Planet! Visit the EQUUS Foundation page to find out how to vote, like, share and donate. Who is your philanthropic idol? Why do you give to PATH Intl. or your center? In celebration of National Philanthropy Day, the Association of Fundraising Professionals (AFP) is asking for a video answer. Submit a one-minute video to help spread the word on therapeutic horsemanship! Submissions are already underway, and the deadline is October 7. On October 10, AFP will display all the videos they've received and open up the voting. On National Philanthropy Day®, November 15, they will announce the top five videos! * Talk about National Philanthropy Day on Facebook and tweet using #npdidol (about your videos) and #npdlove (for National Philanthropy Day in general). Visit the NPD website for more information.